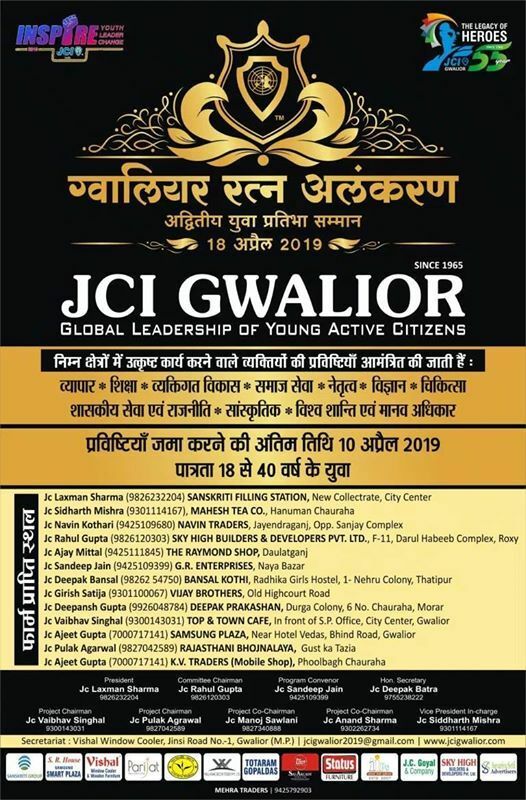 In Gwalior Ratna Alankaran Programme JCI Gwalior felicitate maximum ten OUTSTANDING YOUNG PERSONS (18-40 Year) of Gwalior under ten different categories as prescribed by JCI India. 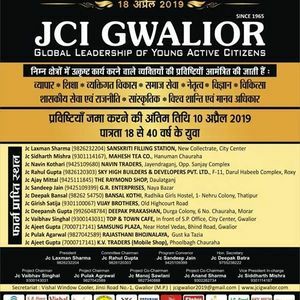 Out of those TEN young persons ONE is being awarded as GWALIOR RATNA. The entries are invited through application. The publicity is done in very grand level by chapter and due to its popularity and non controversial out cones, the main daily news paper of the city (Dainik Bhaskar) is giving media sponsorship for last many years. The main felicitation ceremony is organized by chapter in a very grand level, almost all the Dignitaries , Governement Official’s , Previous outstanding Young Persons. Chapter Member give there auspicious presence. The programme was honored by the presence of Cheif Guest like Late Shrimant Madhav Rao Scindia (Ex- Rail Minister India) , Late Shri Sahib Singh Verma (Ex-Cheif Minister Delhi), Shrimant Yashodhara Raje Scindia (Member of Parliament) , Smt Maya Singh (Ex-Minister M.P.) , Shri Ishwar Das Rohani (Vidhan Sabha President) , Shri C P Jain (Chairman NTPC) , Shri Narendra Singh Tomar (President BJP MP) , Hon’ble Kaptan Singh Solanki (Governor , Punjab & Haryana) Etc.